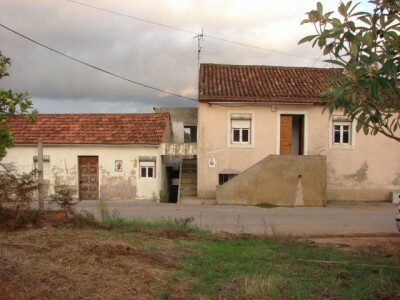 Two old cottages for sale near Ferreira do Zêzere, central Portugal. The cottages, which are situated adjacent to each other, are connected to mains water and electricity and while are in a basic habitable condition do require some modernisation and renovation work carrying out. Cottage One: The first cottage has wooden framed windows and doors and is set over two floors. There is a living room with tiled floors, basic style kitchen with concrete floors. There are two bedrooms, both of which have concrete floors. The bathroom is partially tiled and while functional would benefit from modernisation. The bathroom has a shower, toilet, bidet and pedestal sink. To the rear of the cottage there is a patio area with views over the garden and countryside. Cottage Two: The second cottage is also set over two floors and has aluminium framed windows and doors. To the front of this cottage there is an exterior staircase leading to the main entrance. This entrance leads into a central hallway which runs the depth of the cottage. The hallway has a tiled floor and all rooms are accessed off it. There are two bedrooms, both of which have built in wardrobes. There is a rustic style kitchen with some built in base level units and a corner fireplace as well as a basic bathroom. The bathroom has a tiled floor and a shower, toilet, bidet and wall mounted sink. There are an additional two bedrooms and an extra kitchen on the ground floor of this cottage. The property has around 900 square metres of land, all of which is situated at the rear of the two cottages. The land is flat and there are several mature fruit trees in situ. There are good views to the countryside and while both properties do need renovation work, could be modernised quite easily. The cottages are situated in the village of Aguas Belas in central Portugal. There are several cafes within walking distance of the house and the larger town of Ferreira do Zêzere, which has shops, banks, schools, restaurants, cafes, supermarkets, bus station and health centres, is around five minutes drive from the property. The larger town of Tomar, which is home to the UNESCO listed Convento do Cristo – constructed by the Knight Templars, is approximately 20 minutes drive from the property. The closest airport to the property is located at Lisbon, which is approximately one and a half hours’ by car. Lisbon airport is serviced by a variety of low cost airlines, which operate regular flights into and out of the United Kingdom and other European countries.